It was a wet, wet morning today! Here's my dedicated and hardworking employee (also known as mom) harvesting and artfully bundling all your herbs in the pouring rain. This week everyone has more bunches of wonderful tatsoi, carrots, a head of Chinese cabbage (called Blue), parsley, basil, dill, nasturtium, and a winter squash called Blue Ballet, which is a smaller variety of the traditional (and enormous) hubbard squash. There were also habaneros for those who asked for them. Hubbards can be used like any hard-skinned squash - roasted, pureed in soup, or made into a pie, which is what my mom did with these squash last year for Thanksgiving. CSA member Amy Kottler just picked up her share and gave me her idea for roasted hubbard squash that honestly made my mouth water. She slices the squash in half and roasts it in the oven with butter, brown sugar and salt (2 T brown sugar to 1 T kosher salt) so it has a caramelized, salty-sweet, kettle-corn kind of thing going on... everything about that sounds delightful to me. Thanks Amy! 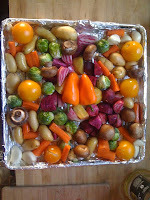 Member Heather Mallak also shared a photo of what she called a "roasting pan of wonderfulness" made with her CV Farm peppers, potatoes, beets and tomatoes - it looks pretty fantastic. My dad's uncle, Gene Rockacy, who actually help my grandfather build this farm, starts tons of these lovely pepper plants from seed and sells them at local markets. They live inside all winter and not only to they look amazing, covered with peppers in shades of red, purple, yellow and orange, but the little suckers taste great - and they're spicy! If you'd like to have homegrown hot peppers all winter long (my mom has had her plant for years) let me know and you can purchase one from him. I have to find out an exact price but I'm pretty sure the small ones are about $4, and I can just pop it in your weekly share. Carol is one of my dear childhood friends (and neighbor!) She and her dad could make anything grow! I'd be delighted to become a subscriber to the farm next year.